U.S. News & World Report's travel editors combed through guest reviews, expert recommendations and industry accolades to determine the top places to stay in Mexico. U.S. News & World Report's travel editors combed through guest reviews, expert recommendations and industry accolades to determine the top places to stay in Mexico. From cliffside escapes to urban boutiques, this impressive group of properties reflects the diversity of high-end hotels across Mexico. Nearly 350 hotels were assessed for U.S. News & World Report's annual Best Hotels in Mexico rankings. Using a comprehensive methodology that accounts for each property's class rating and its reputation among experts and travelers, the travel editors at U.S. news created a definitive list of the best properties in Mexico. Hotels that consistently receive high praise and recognition across the board appear on the third annual Best Hotels in Mexico rankings. Many of the hotels featured below are situated in uniquely tranquil settings -- some stretch along isolated beaches, while others are surrounded by craggy cliffs or verdant gardens. While each hotel showcases a distinctive style, there are three attributes that distinguish the 10 highest-rated properties on the 2015 edition of the Best Hotels in Mexico: inspiring locations, personalized service and luxurious amenities. These traits not only create exceptional experiences, but also win over guests year after year. Climbing up 10 spots to join the top 10 Best Hotels in Mexico this year, Iberostar Grand Paraíso garners high praise from past visitors -- and it's not hard to see why. Perched on a stretch of sand along the coast of the Riviera Maya, the regal retreat shares real estate with its sister resorts, Iberostar Paraíso Maya and Iberostar Paraíso Lindo. Guests will have more than enough to do during their stays here -- the Grand Hotel Paraíso offers three pools, an on-site golf course, indoor and outdoor gardens, and live entertainment. Recent patrons especially appreciate the hotel's four restaurants and buffet. Jumping up 23 spots to claim the No. 9 spot this year, Hacienda de San Antonio isn't on the beach. Rather, it's inland amid lush gardens at the foot of an active volcano. When they're not taking in the views while eating a locally sourced meal with ingredients picked from the property's farm, guests can swim laps in the pool or enjoy horseback riding and mountain biking. And while Hacienda de San Antonio lacks the ocean views of other luxury retreats on this list, this hotel is unique in its isolation -- and many recent guests consider that sense of seclusion a key selling point. Once only accessible by boat or private plane, One&Only Palmilla has all the features of a quintessential tropical getaway, including secluded beaches, infinity pools and a 27-hole golf course. But what sets it apart from similar luxury hotels along the Los Cabos corridor are its specialized amenities for guests: Every room offers binoculars or a telescope for whale-watching and star-gazing along the balcony and 24-hour butler service. Outside the guest rooms, travelers can unwind in private beds along the beach. Plus, the hotel offers facilities and services that cater to a variety of ages and interests, including youth-focused programs for kids and teens, a spa and five on-site tennis courts. 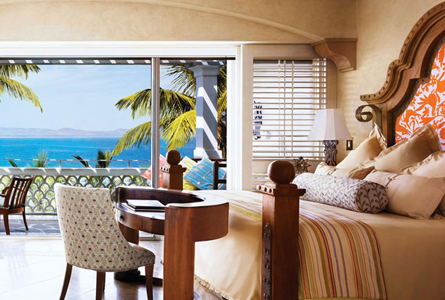 One&Only Palmilla isn't only a standout among discerning guests. This year, the resort made Travel + Leisure's list of the 500 best hotels in the world, and received a AAA Five Diamond Award. And though One&Only Palmilla is currently undergoing restorations as a result of damages from Hurricane Odile, the resort will reopen in spring 2015. Seizing the No. 7 spot this year (up from No. 11 in 2014), Las Alcobas is conveniently situated in the upscale Polanco neighborhood, a high-end district inside Mexico City. This hotel keeps business and leisure travelers comfortable with amenities like Italian bed linens, designer mattresses and central controls for lighting, temperature and service requests. Recent guests praise the modern Mexican cuisine served at one of its two on-site restaurants. The hotel also distinguishes itself by creating a sophisticated atmosphere for guests that is both opulent and inviting, and visitors and travel experts alike are taking notice. Las Alcobas was recognized on the Condé Nast Readers' Choice List and received a Frommer's Exceptional rating. Seizing the No. 6 spot on our 2015 list of the Best Hotels in Mexico, La Casa Que Canta in Zihuatanejo looks like a hotel from Mexico's past. 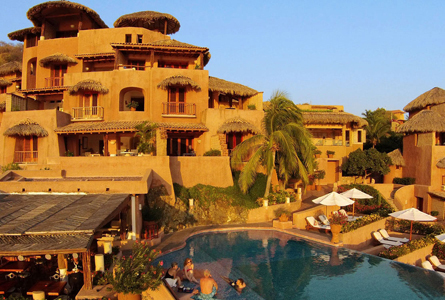 Featuring palapas built with adobe bricks and live trees incorporated into the interior layout, the boutique hotel offers a serene and secluded escape with striking vistas of Zihuatanejo Bay and the ocean. Travelers can spend their days here playing two on-site golf courses, relaxing at the full-service spa or enjoying a complimentary snorkeling or cooking class. And after working up an appetite, guests can sit down for a memorable meal at one of the hotel's three on-site restaurants, which serve fresh seafood and Mexican cuisine. Also showcasing a mix of classic and contemporary design, Capella Ixtapa is an isolated retreat with 59 suites offering impressive views of the Pacific Ocean. Here, guests have access to their own personal assistant who can arrange everything from dinner reservations to surfing lessons to cliffside massages. This hotel is also big on activities, inviting guests to enjoy active pursuits such as horseback riding, arts and crafts, and deep sea fishing. But Capella Ixtapa isn't just a crowd-pleaser among past visitors -- the hotel was recognized as a Concierge.com Editor's Pick and a AAA Four Diamond Award winner. Nestled on a cliff overlooking the Pacific Ocean in Acapulco, Banyan Tree Cabo Marqués offers guests superb vantage points along with plenty of privacy from its well-appointed villas. The villas are built into the cliff, which equips each accommodation with a stellar view. Banyan Tree Cabo Marqués' interior decoration combines contemporary Mexican design with Asian artwork, a fusion of cultures that carries over into one of its signature restaurants, La Nao. What's more, with stunning scenery, an open-air spa, four restaurants and an infinity pool, serenity-seekers can find plenty of ways to relax. And considering that Banyan Tree Cabo Marqués claimed the No. 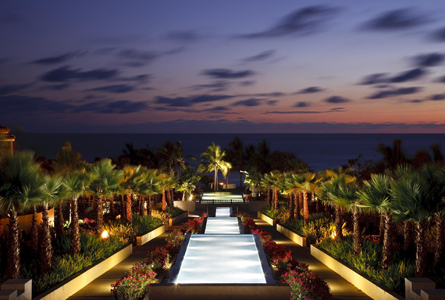 1 spot on the 2014 list of the Best Hotels in Mexico, it should come as no surprise that the property earned a prominent place on this list -- thanks in part to prestigious accolades such as the AAA Five Diamond Award. This St. Regis outpost's secluded location in Punta Mita on the Pacific coast of Mexico is surely one of its greatest assets. During their stay, guests can arrange tennis and scuba diving lessons, tours of Punta Mita, and tee times at the two Jack Nicklaus-designed golf courses. Meanwhile, those seeking an extra dose of relaxation can lounge by one of three pools, schedule a treatment at Remède Spa or stretch out along the beach. With its white-sand beaches and wide array of activities geared toward the whole family, it's not hard to see how this hotel seized the No. 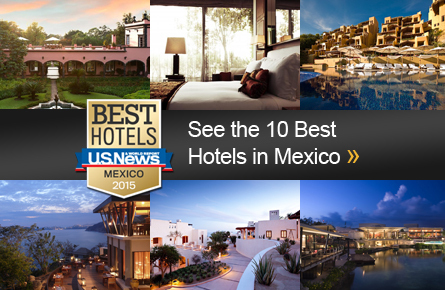 3 spot on our 2015 list of the Best Hotels in Mexico. The hotel's ample amenities and superior service are also recognized by major travel publications: The St. Regis Punta Mita Resort earned a place on Travel + Leisure's 500 World's Best Hotels list and a AAA Five Diamond Award. Occupying 1,600 acres along the northern end of Playa del Carmen, Rosewood Mayakoba features all-suite accommodations with heated plunge pools, outdoor terraces and rooftop sun decks. When you're not relaxing in your opulent digs, you can swim in one of three pools, book a treatment at the full-service spa, or partake in soccer, volleyball or snorkeling along the beach. Recent guests laud the resort's scenery and stellar customer service, and a variety of respected travel publications notice the hotel's offerings, too: Rosewood Mayakoba is a Concierge.com Editor's Pick and a AAA Five Diamond Award winner. Clinching the No. 1 spot on this year's list of the Best Hotels in Mexico, this beachside hotel in Cabo San Lucas indulges its guests with spacious suites and villas, in-room telescopes, four on-site restaurants and a host of activities for the whole family. Meanwhile, for those simply looking to kick back and relax, the property offers a full-service spa and salon, as well as personal butlers who provide service to guests lounging by the infinity pool. 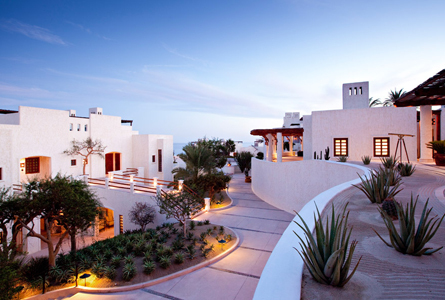 And in addition to topping our list, Las Ventanas al Paraíso earned a place on the Travel + Leisure 500 World's Best Hotels list and AAA Five Diamond distinction. About the author: Stephen Johnson is an intern for the Travel section at U.S. News. You can email him at sjohnson@usnews.com.